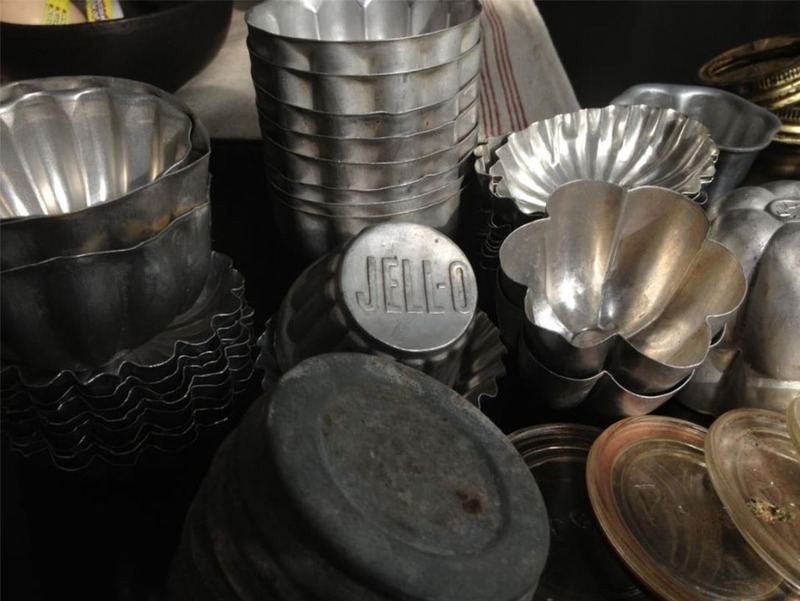 This past weekend I stumbled upon a treasure trove of vintage Jell-o molds at an antique store liquidation sale. They were asking $3 each for them, but after some negotiations I got them way, way, WAY down from that price and brought home the entire lot of 40 (FORTY!) Jell-O molds. I also got them to throw in a bag full of old zinc canning jar lids. Score! When I got them home I found some of the molds say “Jiffy Jell” which I learned was the precursor to Jell-O that began in 1916! Another mold simply said “Made in England, Nutbrown” I have no idea what these might be worth (probably nothing), but they came with the lot, so I was excited to get them. I racked my brain with ideas on how to repurpose these little aluminum goodies. Since I could picture them in so many different scenarios I knew I could never narrow it down to just one idea. 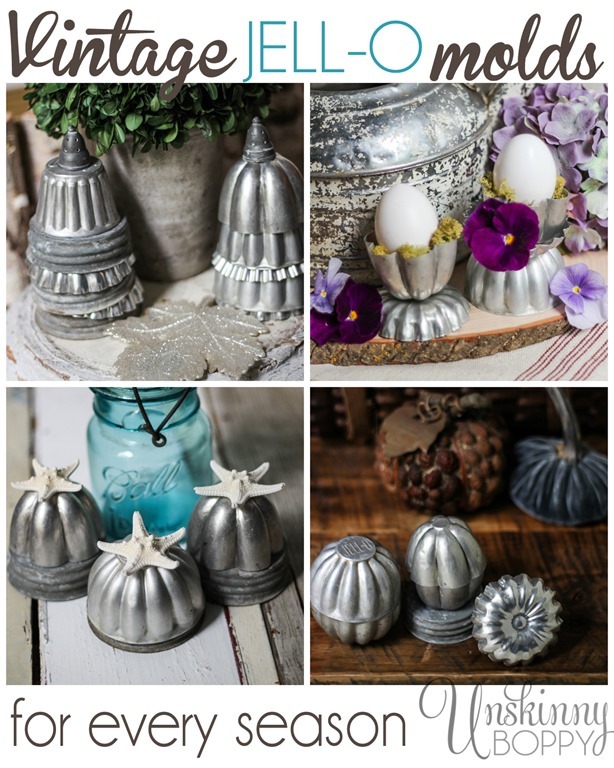 I decided to dedicate this post to decorating with vintage Jell-O molds for all four seasons. Since it’s nearly here, let’s start with summertime. These little molds remind me of making sand castles on the beach and they look a little bit like clam shells, so here is a cute vignette with mini-starfish and a pretty blue Ball jar. Easy breezy. Squish two Jell-O molds together and you know what you get? A cute little pumpkin shape! Perfect for an autumnal arrangement. 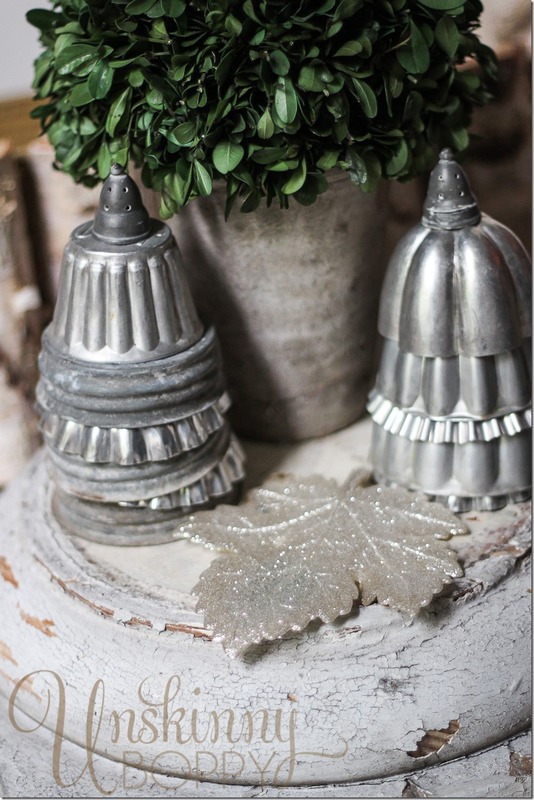 Stack layers of different shaped molds into a Christmas tree shape for winter sideboard scene. The pointy tree toppers? Those would a pair of vintage salt and pepper shaker lids. And finally, spring! 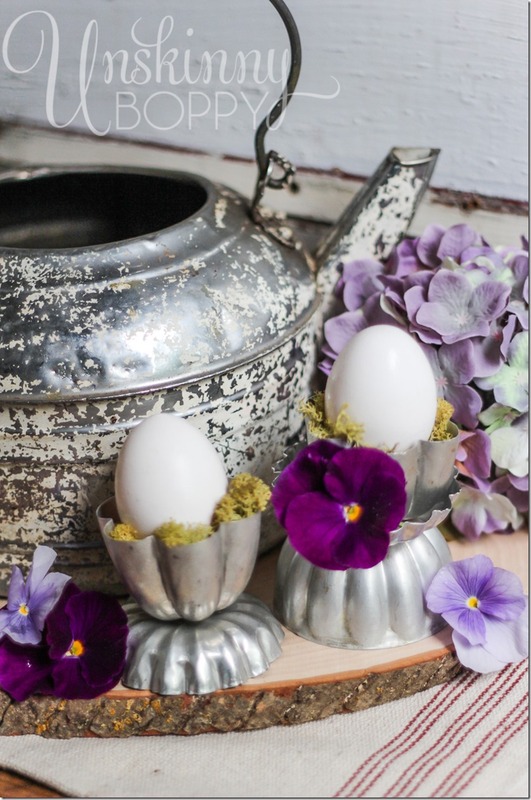 An upside down mold forms the base for another mold to be a pretty egg cup. Fill the cup with reindeer moss and purple pansies and hydrangeas for a happy springtime scene. I still have a ton of great ideas to decorate with these cute little guys, but that is a pretty great start! Tell me–What would you do with them? What items are you always on the lookout for when you go to antique and thrift stores? My mind might breeze right past Spring decorating, but it is always focused on Fall. I see these molds from time to time and wonder too what I could do with them. Now…. 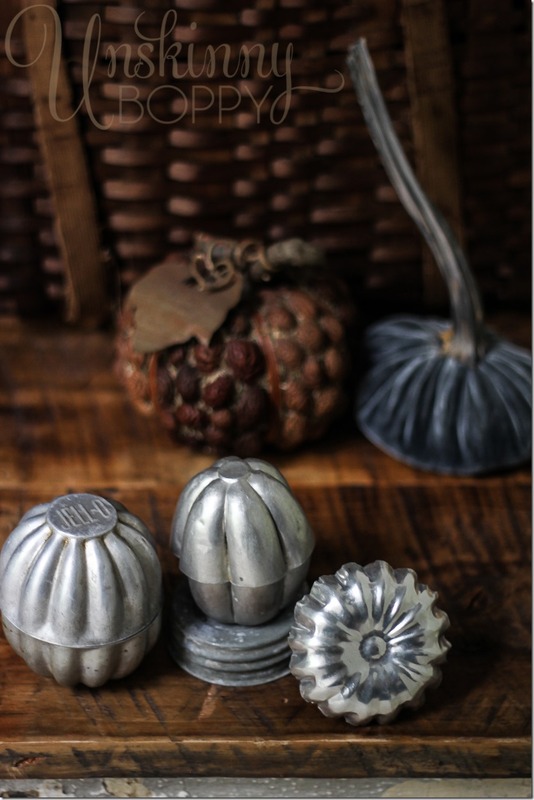 I gotta have some for silver pumpkins. larger molds and smaller ones with a moss base and a bird’s nest I’ve saved. 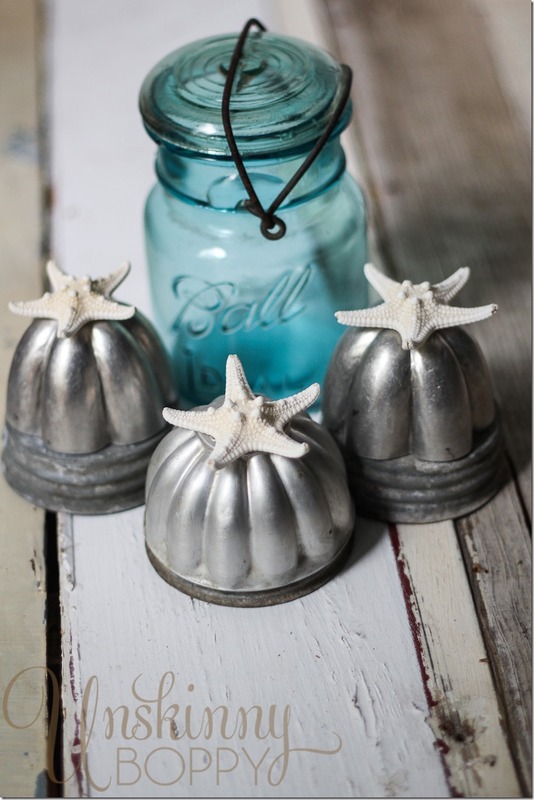 What a SCORE and you’ve come up with some clever ideas to use the molds in decorating. I have no idea of their worth but it’s worth researching. I’m sure there must be people who collect them. Wow!!! That’s one of those scores of a lifetime! FORTY?! I’m a wee bit jealous. LOVE love love love! You are so creative! Saw those on instagram and was curious about what you would do with them. So many ideas, you’re amazing! I especially love the pumpkin idea! 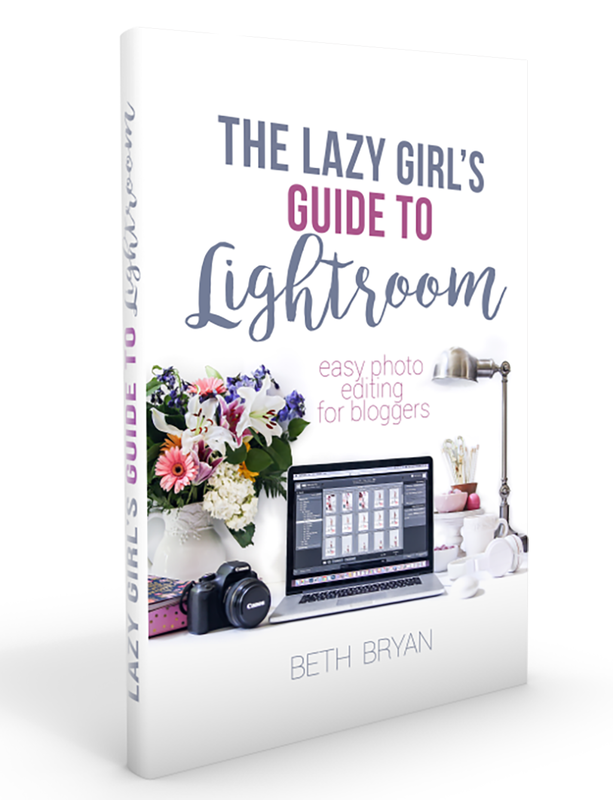 I adore your collection – score!!!!! I am anxious to see what else you can do with these! I love these molds! I have used them: to make pin cushions, to make Christmas decor (filled with kosher salt for snow and bottle brush trees), jewerly containers, craft supply containers, potpourri containers etc. What a lucky find! Would you sell some of them?